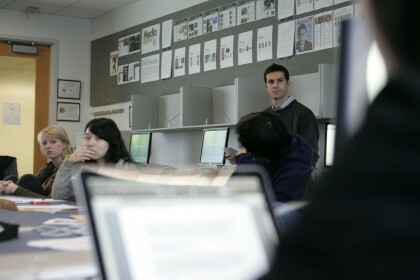 Jeremy Gilbert teaches his undergraduate Medill Advanced Interactive Design class in Winter Quarter, 2009. I’m an assistant professor teaching interactive storytelling and human centered design at the Medill School of Journalism and the Segal Institute of Design. Previously, I worked at The Poynter Institute redesigning its industry leading website, Poynter Online. And at the St. Petersburg Times and The News-Press in Fort Myers, Fla. redesigning both newspapers. I’ve also worked as a user interaction designer and a graphic designer during the first Internet bubble.